Karin and I thought that we would be getting a nurse today from 8am to 3pm so when she got me out of bed another hour early (about two hours after I went to bed) because she had a migraine I didn’t really mind. I was sure that in a half hour or so the nurse would relieve me of my post and I could get a few more hours of sleep. 2 and a 1/2 hours later I realized that no nurse was coming and I would have to muscle through a long day. Karin felt much, much better when she did get up so it was worth it. I actually like the days without nurses because after 9 months in the hospital the last thing we want to do is watch another nurse care for our boy; but when nurses are here both karin and I can get a few hours of uninterrupted sleep. Once she got up I headed over to the pottery to help my dad get set up for his open house/pottery sale. We spent most of the afternoon moving display shelves, pots, and bonsai trees before emptying the kiln of the newest batch of “Liam the Lion” bowls. They are small bowls decorated with lions along the outside and all proceeds from their sales will be donated to the March of Dimes to help other premature babies and their families. The bowls are obviously named for and dedicated to my son and hopefully we will sell out of the current stock and be able to donate close to $2500! I’ll let you know how it goes. Liam had another good day. He slept, he ate, he pooped and he snuggled with his mom, dad, and grampa. He’s been getting more and more aware of himself and his surroundings since he came home. A few days ago he realized that he could control the hands at the end of his arms and that his hand fits quite nicely in his mouth. He has been having a great deal of fun chewing on his fingers and sleeves. 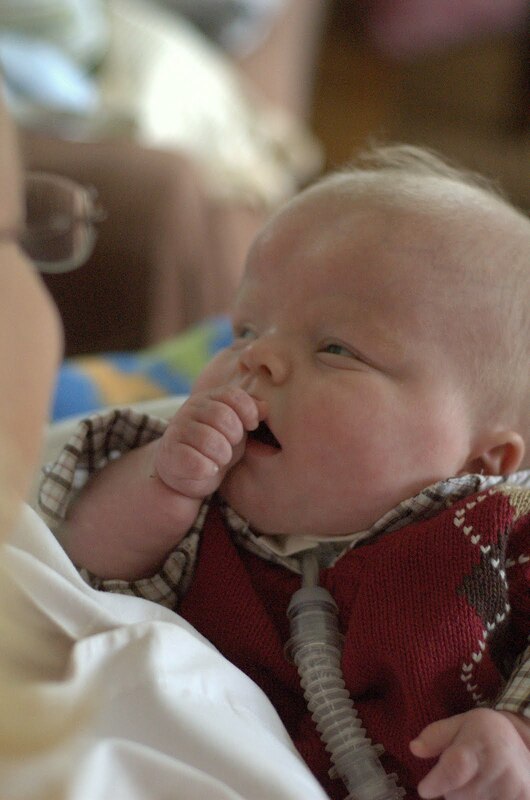 It is a big milestone for a baby who had been sedated and in a medically induced coma for so much of his young life. His favorite stuffed animal continues to draw large smiles and reactions which is also new behavior. I can’t tell you how proud of this boy I am. It’s getting late now and even though my “shift” doesn’t end until 4am, I’m going to check Liam’s diaper, feeding pump and ventilator before seeing if I can grap a nap on the couch next to his crib. Wish me luck.